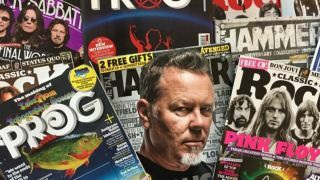 Future publishing has relaunched the TeamRock+ subscription service with 30 days of free access to Classic Rock, Metal Hammer and Prog magazines online. Take out a free 30 day trial on our new and improved payment page and get magazine content before it hits the stores plus access to TeamRock’s archive of back issues completely ad free! The service offers everything that appears in the print editions of Classic Rock, Metal Hammer and Prog magazines, with some stories available before they hit newsstands. Many articles are extended with interactive content, and complemented with access to a 30-year archive of published material. TeamRock+ means that, wherever you are in the world, and whatever device you have, the latest issues of Classic Rock, Metal Hammer and Prog are always available – including back issues and classic stories, enhanced with video, picture galleries and more. And all ad-free! Join our fast-growing community of like-minded rock fans from across the globe and get all the rock you can eat. Sign up is painless and free for 30 days. Click here.